With different projects like Storj, Sia or Burst the use of hard drives and storage space tied to crypto currency mining or sharing files with crypto token rewards may become more attractive to users. With hard drive sizes growing and solutions available for building multi terabyte storage systems available building a multi-terabyte storage solution for use with the projects mentioned above might be viable. We’ve already covered a more affordable home user option for Building an 8 TB Storage Solution for Storj’s DriveShare, but there are options for much larger scale solutions that are still not too expensive, though probably still above the budget of the average home users. 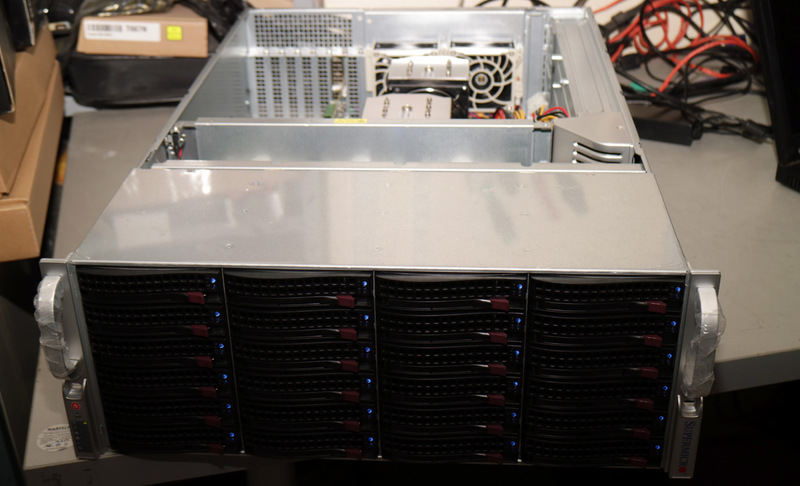 You need to look at more serious server companies for products that are designed for file servers for examples as we are going to be using a Supermicro solution for hosting 24 HDDs in a single rack-mountable chassis. The solution you are seeing here is not particularly designed for use with Burst, Sia or Storj, but we wanted to give it a try using it for them to get an idea what you may expect. The 4U chassis used from Supermicro is designed for file servers in a rack-mountable format, supporting 24 3.5-inch hard drives, though the company offers many different products for 2.5 and 3.5-inch drives all the way up to 90 drives per system and apart from complete solutions you also have the option to go for HDD expanders for many drives that are being connected to separate systems. We have used 24 hard drives from Hitachi with a capacity of 6 TB which in theory should result in 144TB of storage space (in non RAID configuration with mirroring or spare drives), but in reality due to how HDD capacity is being calculated we are actually getting just 130 TB of usable space. 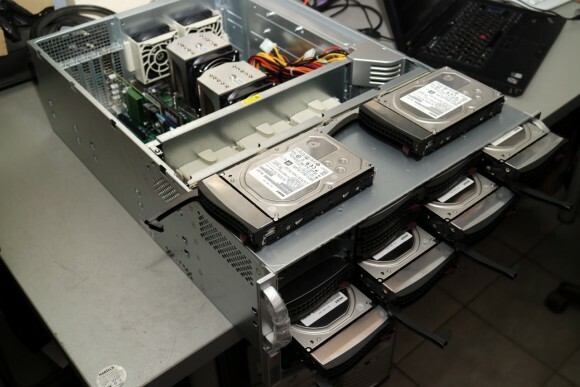 For the purpose of the already mentioned crypto related projects you’d probably want to go for more space than redundancy, especially if you are building such a solution with that many hard drives.